QXL Online is an easy-to-use application which creates Excel spreadsheets from the data in your QuickBooks Online company file. It requires no training – one button exports all of your data. It enables the customer’s familiarity with Excel spreadsheets to allow them to build custom reports and organize data to their preference with no experience in anything but Excel – once they build a calculation macro based on one of these sheets, they never have to build it again — just one click to refresh the data from QuickBooks Online and your reports have the latest numbers instantly. 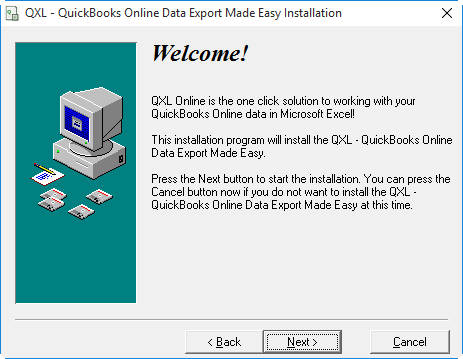 Export QuickBooks Online Data to Excel format via QODBC. 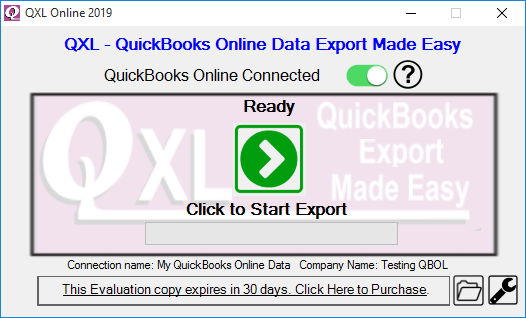 Export QuickBooks Online Data to CSV format via QODBC. Download and click on the Install program (QXLOnlineSetup.exe) to install the QXL Application. Select Next on all of the options unless you want to change the default settings. QXL Online has been successfully installed onto your computer. You can begin using it immediately; it will run as a free 30-day evaluation edition, during which you can export a maximum of 100 records per table, per session. 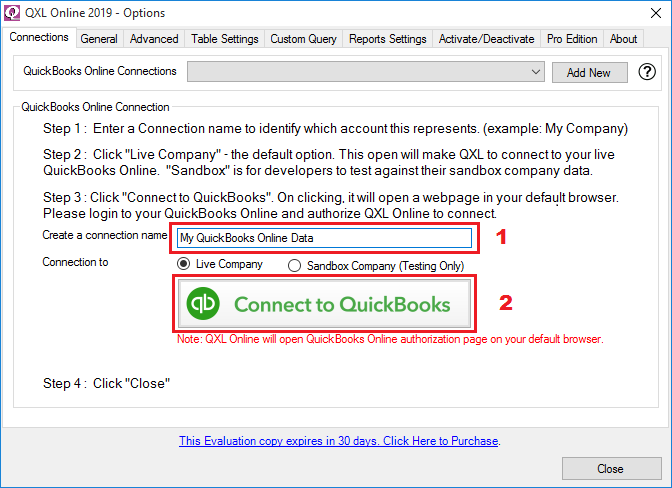 First, make sure you have access to QuickBooks Online company file with Administrator privileges, to authorize QXL Online to connect to your QuickBooks Online Company file. In case you are using QuickBooks Online Accountant (a ProAdvisor) that you need to be logged in to “Your Books” (the option in the left menu bar for accountants) or the client’s books. 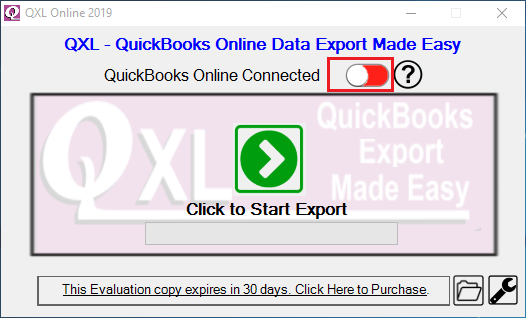 To authorize QXL Online to connect to your QuickBooks Online Company file just click the Red/Green toggle button. QXL will then export the data in your current company file to an Excel file in the output folder. It’s a good idea to use these spreadsheets as source data from this destination folder directly so that next time you need an update it will copy over the source data files in the same place. The best way to make use of this data is in an embedded query – use the Excel documents as source material for your own personal spreadsheets – do not modify these documents directly – otherwise your changes will be lost on the next update/sync. You can find QXL sample reports installed in “QXL Sample Reports” folder under “This PC” –> “Documents” –> ”QXL” folder. 1. QXL-Online-Sample-Report-Customer which contains customers outstanding balance details. 2. QXL-Online-Sample-Report-Invoice-Aging which contains Unpaid Invoice aging details. QXL-Online-Sample-Report-Customer report will show Customer contact details & balance details for the Customer whose balance is more than $1. QXL-Online-Sample-Report-Invoice-Aging report will show Customer details, Invoice details & Invoice aging period details which are pending for more than 30 days. 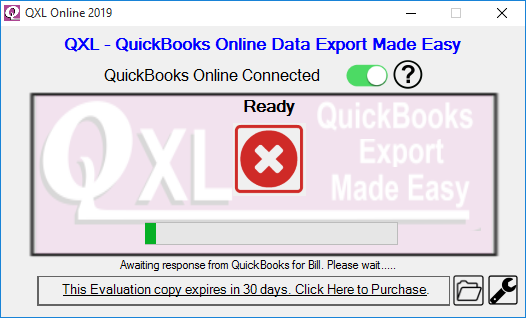 After running QXL Online, you can open these reports to show data from the recently exported data in your QuickBooks system to show how easy it is to report on Excel data exported by QXL Online. Data in the sample spreadsheet will be refreshed using provided QXL Export folder data. Refer: How To Change QXL Sample Report Data Source for more details. Click here for detail information about QXL options and settings. A FAQ section and a Help Desk support system is available for registered users and those evaluating QXL. Portions of this product © Copyright Intuit Incorporated. QODBC and QXL are trademarks of FLEXquarters.com Limited. Windows, Vista, Windows 7 and Windows 8 are registered trademarks of Microsoft Corporation. All other trademarks are copyrights of their respective holders.